on Wednesday, May 01, 2013. 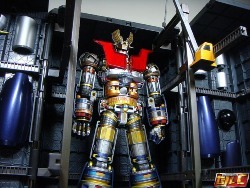 Check out the latest Chogokin and Super robots added to Robot-Japn. We've added more pictures of Popy's GA lineup along with Soul of Chogokin Gems. 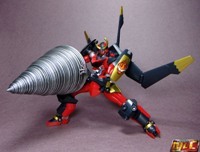 Super Robot Chogokin Gurren Lagann, Might Gain, and Planet X PX-01 Genessis Reviews! on Wednesday, April 17, 2013.
on Monday, April 15, 2013.
on Tuesday, February 05, 2013.
on Monday, January 28, 2013.
on Friday, November 30, 2012. Hi all, here's the review for the CM's Brave Gokin 38 Jeeg Option Parts. This is the "Toyshunter.It" Italian Exclusive version, contains a total of 3 bodies instead of just 1, so that each Option Part can be displayed all at once. This version was shipped out a month later than the standard release. Written by Jack on Tuesday, November 27, 2012. Upon receiving this goody, I was like "whoa the box is pretty heavy"... usually a good thing. So I took the box out and noticed one larger box sleeve with 2 smaller boxes in inside it. One contained the God phoenix Jet, the Other the vinyl Fire Phoenix ... I think conceptually the vinyl is pretty cool, and it's pretty large measuring close to 18" in length. I found the head and the underbelly were sort of difficult to pop into place. It's cool to look at but displayability is minimal, as opposed to the Jet itself which comes with a nifty little stand. There is another issue that i will touch on a bit later. on Saturday, November 24, 2012. I had the pleasure to meet Marty at New York Comicon. I knew I wanted to get my hands on his castings. They are just too beautiful to pass up. The heads are sculpted by Marty Hansen and Jason Frailey. These heads were originally produced for Matt Doughty's Armorvor line. Marty's castings are hand-pulled limited editions in custom colors, which means when the cast goes that's it folks! on Wednesday, November 21, 2012. I went to Comicon NY and I had approximately 3 hours to do my business as I didn't have a multi-day pass. In my fenzied state my gaze came across Monsterpants spread of candy-colored action figures I knew then and there I was going to give this man my money and I told him this. A few days later I said I wanted to give him even more of my money. I was hooked on Sea-Borgs. on Sunday, November 18, 2012. My newest foray, mixing indie toys with vintage Micro action, first up is Ni-Stuff's groovy Gylos head sculpts. I picked up these jewel-like Glyos compatible heads from Ni-Stuff at Comicon NY. I knew they had great modding potential.